To help advance the prediction of phenomena occurring on time scales between weather and seasonal predictions, NOAA’s Modeling, Analysis, Predictions, and Projections (MAPP) program—in partnership with the National Weather Service’s Office of Science and Technology—is funding 14 new three-year projects. These competitively funded projects involve $5.5 million in grants and $1.2 million in other awards (for a total of $6.7 million). With the background of a changing climate, NOAA strives to enhance community resilience in the face of weather and climate extremes. To help achieve this goal, NOAA scientists are seeking to extend the lead times at which they can skillfully predict extreme events such as heat waves, drought, and hurricanes. More advanced notice of extreme events would provide emergency managers, water resource managers, and decision makers in agriculture, health and other sectors more time to prepare and better allocate resources in order to safeguard life and property. Traditionally, prediction efforts have primarily targeted the separate communities of either daily (“weather”) or seasonal lead times. 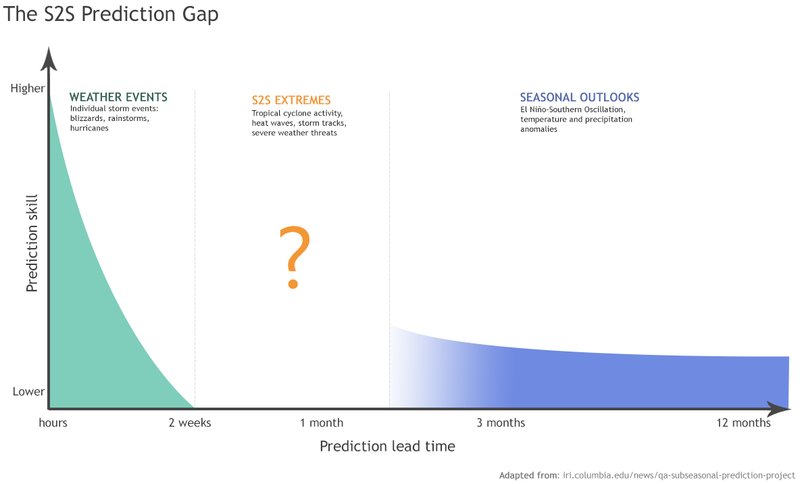 The need to improve the ability to bridge weather and seasonal forecasts (between two weeks and two months), also known as the subseasonal to seasonal (S2S) prediction gap (see image), is recognized as a high priority both nationally and internationally. The 14 competitively selected three-year projects will help advance our capability to model sources of S2S predictability, enhancing NOAA’s ability to predict the threat of extremes such as heat waves, hurricanes, heavy rain, and extratropical cyclones at lead times beyond weather. The researchers leading these projects will constitute a new MAPP-organized Subseasonal to Seasonal Prediction Task Force – the purpose of which is to bring to bear the expertise of top scientists from both the weather and climate communities to help close the S2S prediction gap through enhanced communication and synergies. Additionally, the Task Force will provide a bridge between NOAA-driven activities and the broader national and international research community by collaborating with World Meteorological Agency (WMO) S2S Prediction Project. The S2S Prediction Project is a joint initiative of the WMO’s World Climate Research Programme (WCRP) and the World Weather Research Programme (WWRP) to advance research on forecasts between weather and climate timescales. This funding will complement internal investments towards S2S efforts at NOAA’s labs and centers of excellence across the U.S.
MAPP is a program in the Climate Program Office, within NOAA’s Office of Oceanic and Atmospheric Research, that supports research to advance climate modeling technologies to improve simulation and understanding of climate variability, and predictions and projections of the climate system. To learn more about MAPP’s funding opportunities, visit: http://cpo.noaa.gov/ClimatePrograms/ModelingAnalysisPredictionsandProjections/FundingOpportunitiesFundedProjects.aspx.